Having just had a few crazy weeks of assignment writing, conference preparation at work and general hectic-ness, I'm now ready to write another blog post! Woo! 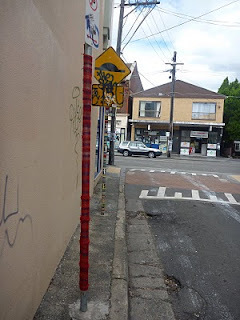 I mentioned a while ago I was interested in writing a blog post about why I love Sydney, and Ronni recently posted a link to a blog project photographing the suburbs of Sydney, which inspired me to do something about it. Incidentally, that blog posted a link to the Dictionary of Sydney, which looks like an interesting place for information on all things related to Sydney. - Festivals in Summer! When the whole city comes into one space and the streets are full of people instead of cars and everything is free. - The coffee! It looks great, it tastes great... It means we have heaps and heaps of little cafes. Everyone I know who travels overseas misses it oh so much. - As well as the unofficial whimsy, of course. 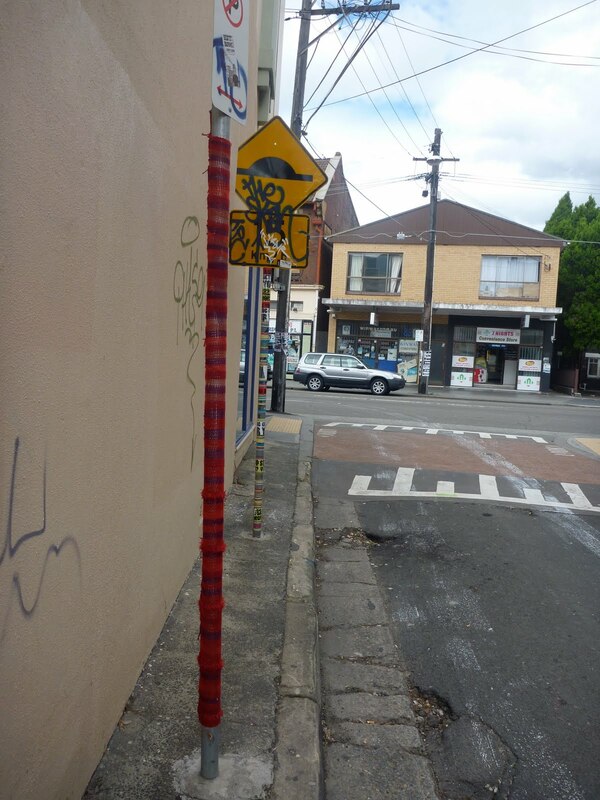 The type of thing that inspires people to knit stockings for street signs. - The sea and storm clouds are so good together, and it's hard to dislike the Manly ferry. - Even some of the cemeteries have a view... I think cemeteries are beautiful in any case. - The skyline... Let's face it, even people who diss Sydney think it's beautiful. Oh, this is such a beautiful post! I'm so glad you wrote it. I, too, love Sydney, and your lovely photo-essay articulates a lot of the reasons why. Ihave nothing to add but I agree that this post is great and your photos are fantastic!